Hello Severn Wishes followers! Today I am talking about Nappies! 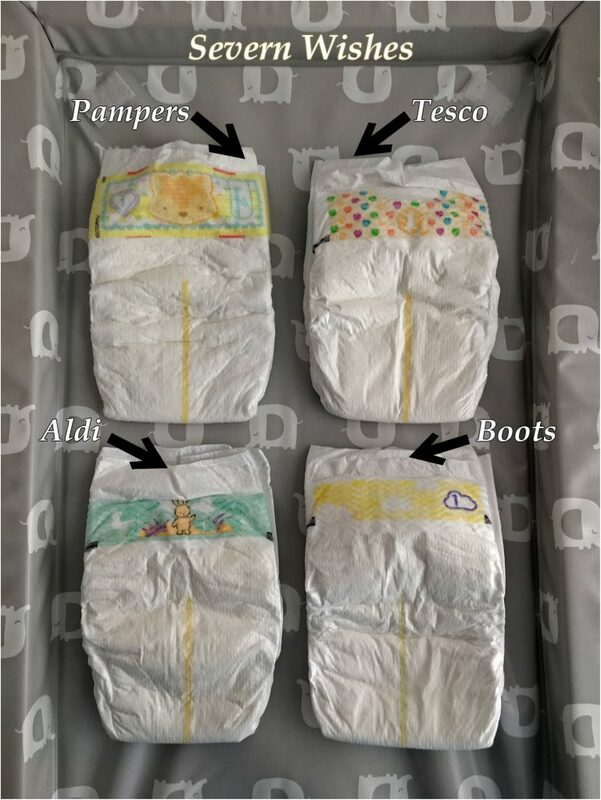 In fact I am doing this short review post today about which Newborn Nappies we found to be best. I am comparing on several different levels. Our son is moving on to the next size up now, and it’s been interesting to look back at what we have tried and tested and what has worked for us. And it’s also been useful to compare prices! We shopped around to be competitive and even tried other brands because other brands were expensive. Details – 4 – 11 lbs (2-5kg), Wetness Indicator. Quilt lined so as to pull wetness away from baby’s bottom. Soft materials used and air channels to keep the skin breathable. Navel friendly shape and design for newborns. Nappy design has size increase indicator lines. Recommended by the British Skin Foundation. My Opinion – The design is great on Pampers, they are soft and have a good fit. We have had over 100 of these nappies and only 1 that leaked. I would purchase these nappies but only on special offers and not at full price. Details – 4 – 11 lbs (2-5kg), Wetness Indicator and it has Soft Cord Protection. Hypoallergenic and Dermatologically Tested. Nappy design has size increase indicator lines. The sticky tabs are strong and they are also a different colour which makes it easier to see on those sleepy nappy changes in the middle of the night. It has a nice colourful design as well. My Opinion – Overall a great fitting nappy that is soft for baby and affordable too. We haven’t had any nappy malfunctions as yet and we have now used over 300 of this type. Details – Size 1 is 4 – 11 lbs (2-5kg), Wetness Indicator and Soft Cord Protection. Hypoallergenic and Dermatologically Tested. Anti Leak System and Breathable Soft like Cotton. Nappies are made from fibres that are from sustainable forests. With a cute character on the front and size increase indicators. My Opinion – Very soft and easy to apply with the long sides and long frills to prevent leakages, a great nappy overall. We have been very happy with the ones that we purchased, both quality and price. Details – Size 1 is 4 – 11 lbs (2-5kg), Wetness Indicator and Soft Cord Protection. Hypoallergenic and Dermatologically Tested. Basic Design. My Opinion – We had 3 Nappies leak out of the 24 in the pack. They were not as soft as other brands either and I had two nappies where the tabs came clean off during a nappy change rendering that nappy unusable. I would happily continue with either Tesco or Aldi Nappies. We prefer shopping in general at Tesco though, so we wouldn’t go out of our way to find an Aldi store just to get their nappies. However if we were passing one or heading there for another reason I would more than likely stock up on a few of their Mamia Nappies, they are good quality and very affordable. The Tesco Loves Baby Nappies have been best overall while staying affordable, and the bonus is that we get points on our Tesco Rewards card. Thank you for reading this short review post today. I hope that I have given you an insight into the world of Newborn Nappies and if anyone needed some inspiration on what brand to try… you now have my opinions.